CfC Stanbic Bank was voted Best Mobile Solution provider for its bulk payments innovation that has leveraged off the penetration of the mobile telephone services to widen financial access in Kenya. CfC Stanbic Bank has been voted the best Mobile Solution Provider in this year’s Global Finance Magazine Awards. CfC Stanbic Bank’s innovative solution to provide a seamless channel for execution of bulk payments in Kenya via mobile banking emerged tops in a field that featured the world’s premier financial services institutions. The Annual Global Finance Magazine Awards rank and recognize the Best Treasury and Cash Management Banks and Providers around the world. 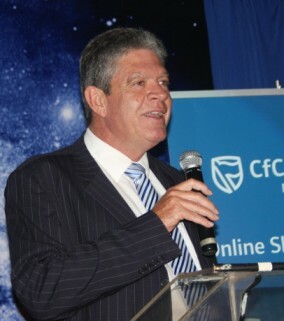 Greg Brackenridge, CfC Stanbic Bank’s Managing Director said the award was a culmination of the bank’s consistent effort to provide innovative banking solutions while increasing the levels of financial inclusion in the country. “By partnering with established mobile service providers, CfC Stanbic Bank has brought financial services closer to the majority of Kenyans who would otherwise not have any access to these services ” added Mr. Brackenridge. CfC Stanbic Bank’s mobile payments solution is widely seen as the answer to the challenges faced by huge corporate institutions in expending payments to a large number of people, a good number of whom do not have access to banking services. CfC Stanbic Bank has partnered with mobile telephony service providers to offer a mobile banking service that enables corporate clients to disburse bulk payments such as salaries, dividend payments, per diem allowances and pension payments to various beneficiaries through their mobile phones. In Kenya, 47% of all money transfer services are currently carried out using mobile phones as opposed to conventional payment channels such as clearing houses, bank branches, automated teller machines (ATMs) and money transfer services such as Western Union. The payment solution, which was launched in September 2009, is not limited to CfC Stanbic Bank’s account holders. CfC Stanbic Bank’s mobile payments solution facilitates payments to anyone who has access to a mobile phone regardless of whether or not they hold an account with the bank. This service works on Safaricom’s M-PESA and Airtel’s Airtel Money Transfer (formerly known as ZAP) platform. Yu’s ‘Yu Cash’ mobile transfer proposition is set to come on board in the near future. In a press statement released by Global Finance Magazine, publisher Joseph Giarraputo said the mobile banking category was introduced in this year’s awards to reflect the changing competitive global economic environment bank treasurers are now operating in. “In today’s competitive global economic environment, treasurers need the best tools and advice available to make capital work harder than ever,” says Global Finance publisher Joseph D. Giarraputo. Only 19% of Kenya’s adult population is banked. Beneficiaries without bank accounts have to be paid in cash in a time consuming exercise that increases the inherent risk associated with handling cash. Security concerns have made the handling of cash and cheques risky, prompting the need for secure and reliable payment solutions. CfC Stanbic Bank’s mobile banking product eliminates the need to carry hard cash and allows recipients to only draw on e-money as and when it is needed. Using CfC Stanbic Bank’s mobile banking product, electronic money is converted into cash at any of the more than 20,000 M-PESA payment points, over 4,000 Airtel Money payment points, Pesa Point & Equity Bank ATMs countrywide. CfC Stanbic Bank also recently received awards in this year’s Think Business Capital Markets Awards in five categories that included, Bond Deal of the Year, Investment Bank of the Year, Leading Custodian of the Year, Best Lead Transaction Advisor of the Year and Research Team of the Year. Congratulations on this no mean achievement. What about the CFC insurance subsidiary? Can clients also transact via mobile phone money transfer service?